We offer Ceftriaxone Sulbactam Injection, which is a dependable duo against resistant infections. 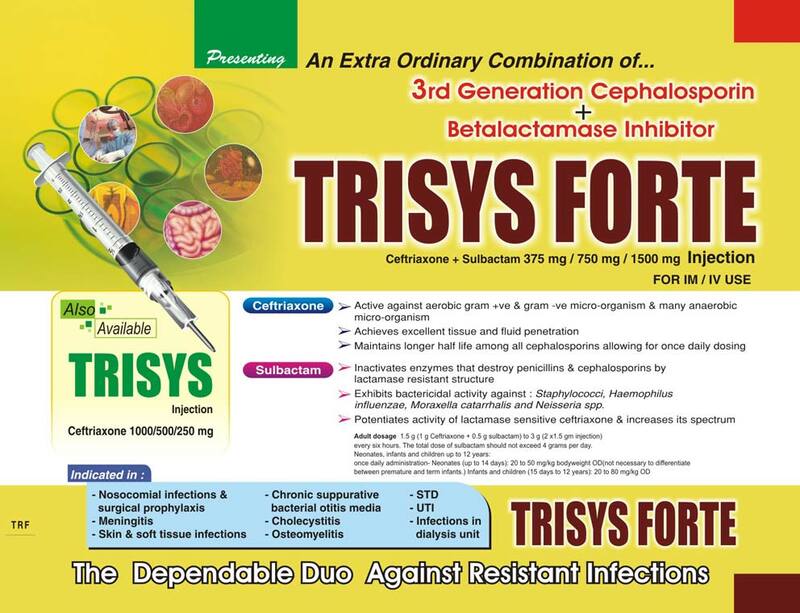 The Ceftriaxone Sulbactam is an extra ordinary combination of 3rd Generation Cephalosporin + Betalactamase Inhibitor. Specially formulated for Im / IV use, Ceftriaxone Sulbactam Injection is available in Ceftriaxone + Sulbactam 375 mg / 750 mg / 1500 mg.
Exhibits bactericidal activity against : Staphylococci, Haemophilus influenzae, moraxella catarhalis and Neisseria spp. Adult Dosage : 1.5 g (1 g Ceftriazone + 0.5 g sulbactam) to 3 g (2 x 1.5 gm injection) every six hours. The total dose of sulbactam should not exceed 4 grams per day.